After a nun named Index suddenly appears on his railing, Touma Kamijou’s wish to maintain nothing more than a low profile goes straight out the window when magic and science collide in Academy City! As a student of Academy High, Touma Kamijou is considered one of the leftovers because of his lack of ability and wants to simply maintain a low profile as he goes about his days. However, he has one unexpected ability that soon proves to be his ace in the hole: the Imagine Breaker, an ability in his right arm that allows it to break the ‘abnormality’ of anything it touches, including both esper magic and sorcerer magic. After a particularly intense encounter with an proficient ability-user, Touma wakes up to find a young nun hanging on the railing. Soon, Touma is drawn into a battle of magic and science as he and Index attempt to evade pursuers set on taking the 103,000 grimoires Index possesses. Fans of action or fantasy stories with a more unique setting will likely find A Certain Magical Index very appealing. The first thing that really struck me about A Certain Magical Index Vol. 1 is how deep its setting is, and this was one of this story’s key strengths. I found the initial chapters a little bit confusing as the world was introduced at an extremely fast pace but as the volume progressed the story did a good job filling in the gaps. I found the premise of science and magic clashing to be quite compelling and gave a satisfying sense of tension to Touma and Index’s struggles in this volume. One of the real highlights of this volume was the battle between Touma and one of Index’s pursuers, and this stood out because of the way the story and art came together to create a lengthy and thrilling sequence. I won’t give away what happens, but I was very impressed with the way this scene helped to provide characterization to Touma while continuing to flesh out this story’s setting. It was exciting to see this world’s rules in action during the sequence and this gives me a lot of optimism about the potential the tension between science and magic could deliver as the story progresses. In addition, author Chuya Kogino’s artwork become noticeably better during this sequence, with the panel layouts perfectly conveying the action in a clean and uncluttered manner. All in all, this volume’s main action sequence delivered and is almost worth a purchase all by itself because of how exciting it was as well as for the potential it suggests this series has. For a story that clearly has a dense underlying logic and mythology, I was impressed that this never came at the expense of the pacing. The story never becomes bogged down in exposition, moving a long at just the right speed while continuing to establish the world of Academy City. While the introduction could have been refined to be a little more clear during the first few chapters, the later half of this volume make up for it with a combination of fast-pace action scenes spaced out between slower scenes, allowed me to catch my breath. Index Vol. 1 was never boring at any point and should satisfy readers looking for story with deep and compelling setting that doesn’t come at the expense of its pacing. One of the biggest drawback of this work was the art style, which fell a little bit on the simplistic side and was largely forgettable in relation to other comparable works. This doesn’t mean that it was bad by any means as the panel layout did a good job at cleanly conveying the story. Slower scenes visibly suffered more as Kogino clearly focused his energy on the action scenes, which looked great and really benefited from the attention. However, I would have liked if this extra detail could have been carried over consistently throughout the volume as this would have really enhanced the presentation of this series to go along with its story. Kiyotaka Haimura’s designs were another aspect of this series I felt could have been improved upon, as the character designs ranged from unremarkable in the case of Touma to quite questionable in some instances. Even the best character designs felt pretty par for the course, with no real memorable characteristics to make the characters stand out. In particular, the design of Touma’s teacher Komoe Tsukuyomi was jarring and difficult to take seriously as her childlike design adds nothing to story and seemed to clash tonally with her role in this volume. While the setting receives a lot of excellent focus in this volume, I would have liked if Index spent a little more time fleshing out its characters. Characters receive a minimal amount of characterization and aside from Touma’s moments during his battle sequences, it’s tough to say after reading the volume that I know any more about what makes these characters tick than when they were first introduced. I really hope that this lack of focus on the characters was because of a need to establish the setting and that future volumes will address this to make the story stronger. A Certain Magical Index Vol. 1 is a solid and compelling start to the series, drawing me in with its interesting setting borne of the clash of science and magic. While the characters on the whole were unremarkable both in terms of characterization and design, the setting makes up for this and provides a lot of potential for the series to eventually flesh out its characters more without sacrificing its pacing. Finally, main action sequence in this volume was thrilling and a lot of fun, making me quite hopeful for the potential this series has once it really gets rolling. Index Vol. 1 does a lot right and will satisfy those looking for a good fantasy based action series with its promising setting. What do our scores mean? Square Enix’s Shounen GanGan magazine. Volume 2 will be published in English on July 21, 2015. 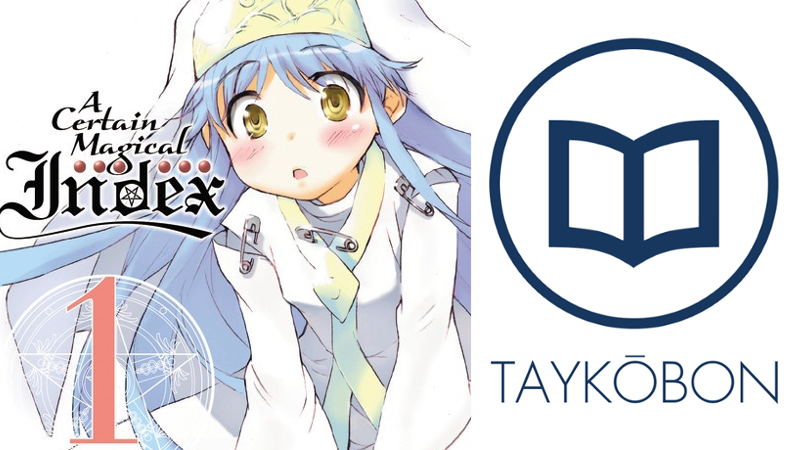 For more reviews, keep an eye on AniTAY as well as Taykobon, our new page for reviews of manga and light novels. You can also follow us on twitter @taykobon for more updates! If you’ve read this work or have any questions or comments, we would love the hear from you in the comments below! *Copy provided for Taykobon by publisher.